On the west coast of the island of Vis there is located, picturesquely situated at the foot of the Hum hill, the second largest town of the island – Komiža. This old fishing village now attracts crowds of tourists. Here you can admire the most beautiful sunsets on Vis. When the sun is hiding in the waters of Komiža bay, the last orange rays illuminate a sandstone-built town. The Komiža bay is a deep bay, stretching from the Stupišće peninsula in the south to the islets of Veli Barjak and Mali Barjak in the north. These islets are located near the westernmost cape of Vis – Barijoška. Mali Barjak is further off the Vis island – the distance is about 600 meters. On May 23, 1930, a very strong wind from the south (jugo) blew. The sea was so turbulent that waves surfaced over the islet of Mali Barjak. Despite the weather conditions, an Italian steamship – Teti – were passing the island of Vis. Experienced crew misjudged the distance from the islnad and the ship hit the islet of Mali Barjak. Local fishermen, under the command of the port’s captain, came to help and saved lives of all crew members. Unfortunately, it failed to save the steel ship built in 1883. With the next storms, the wreck began to sink deeper and deeper on offshore part of the slope of the islet of Mali Barjak, finally touching the sandy bottom at the depth of 35 m.
Diving on the wreck of Teti is available to divers at all levels of training. 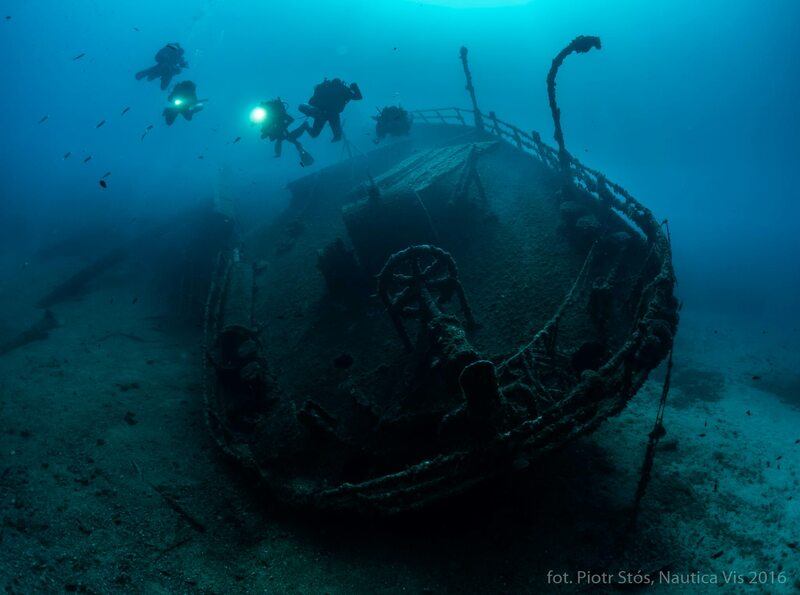 The wreck of the 72-meter ship begins at the depth of 10 meters. The shallower part is more damaged due to the long-term crashing of the rocks. Deeper wreck is definitely better preserved. 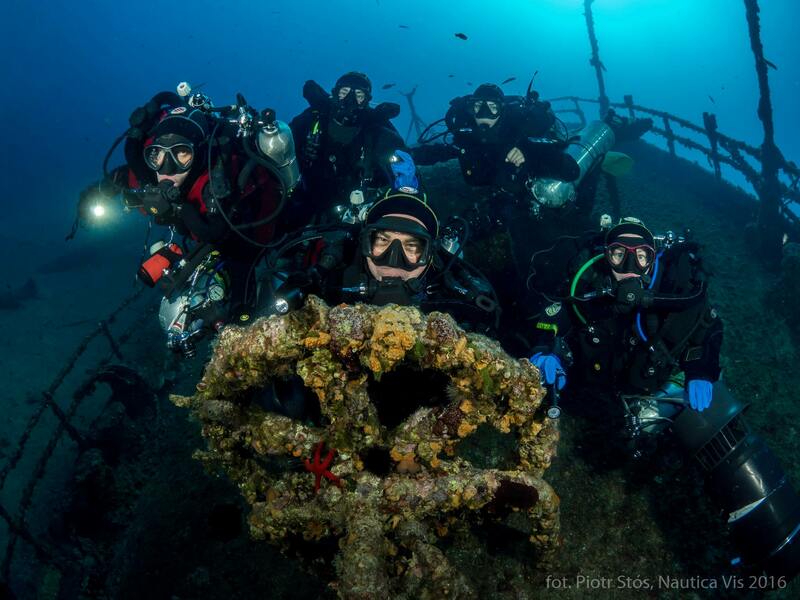 Its most picturesque element is the spare steering wheel located on the stern and covered with yellow and purple sponges – this is the place where probably most diving pictures from the island of Vis are taken. Long period underwater did its own thing – the wreck has gained a lot of residents. Human created spaces are liked by marine predators. It’s easy to find on the wreck murray eels, scorpion fish and exceeding the length of 2 m European conger. The ship was carrying cobblestones. The cargo was scattered on the sandy bottom of the wreck, what don’t bother the groups of striped red mullets living there. In the shallows, above the damaged part of the wreck, a variety of colourful fish can be found – Mediterranean rainbow wrasses, ornate wrasses and Mediterranean parrotfish. Rich marine fauna suggests that the water in this place contains enough organic matter, which in turn is due to water mixing. Although the dive site is suitable for the beginners, sea currents and waves might exist in this place. If the conditions were always perfect, no ship would have crashed here.